All songs written, arranged, and produced by Karen Lloyd. Mixed by his awesomeness Lou Gimenez at the Music Lab. Mastered by the amazing Scott Hull at Masterdisk! A special thank you goes out to Lou Gimenez, Dave Anthony, Andy Pfaff, and Rick Kolster, my peeps!!! All of whose expertise and awesome talent played a huge part in making this record sound the way it does. You guys rock so hard! I'd also like to thank my parents Bruce & Sallie Lloyd, my brother Dan Lloyd, and my boyfriend Rick Kolster for their love and support in my life and my music. This record was a long labor of love. When I was younger I became very confused by many people telling me who I should sound like, what would be the most "marketable" route for me. i was pulled in many different directions and although I had some wonderful experiences and learned a LOT, I never felt like I had found my true voice. Then, I had the opportunity to do some touring and see the world which was a great experience, but also taught me some things about myself, and about what is hype and what is real and true. it also gave me some space from my former original projects and enabled me to begin on a new journey in writing. When the first song of this bunch came out of me it was like i discovered a secret wonderful and magical place that I hadn't known was there all along! I became hooked and at times totally obsessed. It took me 2 years to write the material and do all the pre-production in my own studio, basically doing full recordings of each song to make sure I had the arrangements and production ideas right. Then I took all of my Logic files over to the great Lou Giminez, and we began the process of reorganizing, re-amping the guitars, recording Dave Anthony (drums), and Andy Pfaff (bass), replacing my initial basic drum and bass ideas with Dave's and Andy's incomparable musicianship! Then the very involved mixing process began. If any of you have listened you can hear that I got a little carried away with the production. I had a vision of classical piano, meets powerful orchestral strings, meets power electric guitar. All in the same register. very tricky. But Lou hung in there with me and I'm thrilled with how it turned out,. : ) although,... It never turns out the way you quite envisioned it in the beginning. It turns out that I wrote a bit more of a rock record than a beautiful balance and dance between progressive rock and an orchestral classical vibe initially in my mind. But you'll hear all those influences in there. My biggest goal was to try to create a very musical record calling upon all of my favorite musical references from The Beatles, Zeppelin, Shirley Manson(Garbage),Sting, Evanescence, Billy Joel, Avril Lavigne, Chopin, Brahms. I wanted to sneak in a lot of music so that musicians listening would do the "ooh - that's a nice progression" thing, but yet keep all the songs fun and easily digestible for any listener with hooks that are hopefully memorable. I hope that if you take the time to listen to this record that you truly enjoy it, and that it takes you on your own personal journey in the same way as a child, I used to let an entire album take me away while I closed my eyes an imagined a story unraveling in my mind. Also, if any of you are thinking of doing a record that has the snappy facility of digital, but the warmth of the analogue sound, then go see Lou at The Music Lab. He is amazing. 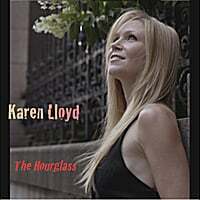 Check out Karens New Release; The Hourglass CD!! © 2019 Karen Lloyd. All Rights Reserved. Powered by HostBaby.